Neighbors, did you know we are in danger of losing our osprey nest? This is due to the expiration of the temporary permit for the nest platform pole. There is a small article on the Zidell website telling the story of the current platform. Please see the note below from Carol Otis outlining the situation. If you want to help, you can send a message to Commissioner Nick Fish asking for an appeal. Attached is one of the last videos I took of the osprey adults and the chick in September 1, 2011 before they left for migration. This video is likely to be the last we will ever see of the SWF osprey at its chosen nest site. I regret to tell you that all of our efforts to retain the nest platform pole at the current location have not worked. Our temporary permit expires soon and we have no choice other than to demolish the pole and send it for scrap. 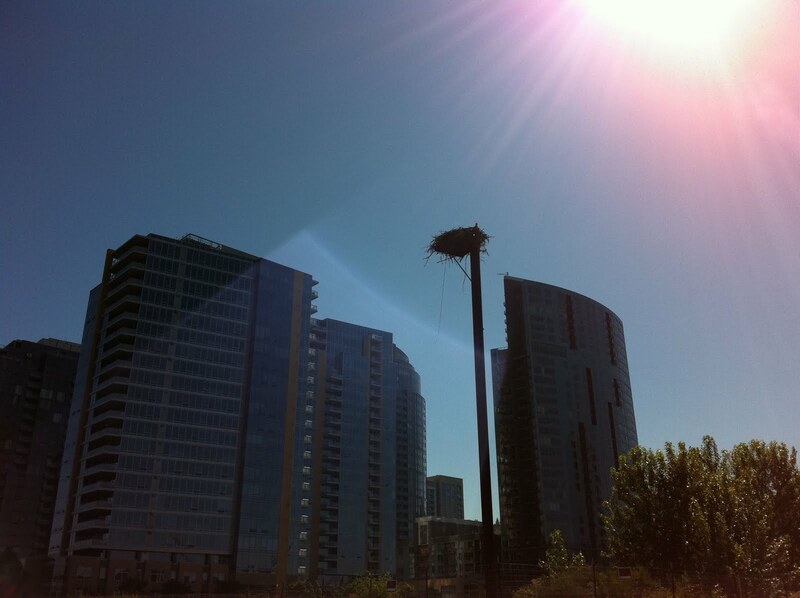 There is no osprey nest platform in the final Greenway plans. "please allow the osprey nest platform pole to stay in it current location " it is great for our community, and for the city of Portland. I have also attached a petition that you are welcome to sign and distribute among friends and mail to me. The more the better and I hope to get an appoitnemnt with the commissisonrer if there is adequate public support. Please contact me if you need more information or have questions. Aw, I'll forward this information to the SW Charter School. I don't even know if they know about it, but I bet they'd be interested. I mean, they can't put in ICE AND take away a bird nest. Too cruel!